Nancy's zealous advocacy for employee rights grew naturally from her political activism formed in the 1960's. She was in 7th grade when President John F. Kennedy was assassinated, in the midst of the televised civil rights struggles and demonstrations in the southern U.S. Learning that African Americans and their supporters were being beaten and murdered in their quest for the right of persons of color to vote was incomprehensible to her. The little black girls being hosed to the ground were her age or younger. The right to vote and politics took on a religious significance to her. The Vietnam War raged during her high school years, and then came 1968, when she was a junior in high school: the peaceful civil rights leader and anti-war protester, Dr. Martin Luther King, was murdered. A few months later, Sen. Robert Kennedy, whose presidential campaign advanced the anti-war theme begun by Senator Eugene McCarthy, was murdered. Nancy headed to Washington, D.C., the center of government and the site for the largest anti-war protests, civil rights, gender equality and environmental justice demonstrations in the nation's history. As a political science activist-student at George Washington University (3 blocks from the Nixon White House), she worked with the GWU administration to house and feed the tens of thousands of anti-war protesters who poured into the campus for the series of the massive demonstrations taking place on the Mall and around the White House between 1969-1973. 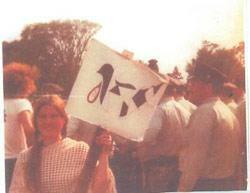 Nancy at an anti-war demonstration on the Washington, D.C. Mall, 1970. In 1972, Nancy volunteered for anti-war presidential candidate Sen. George McGovern, both in D.C. and in N.H. 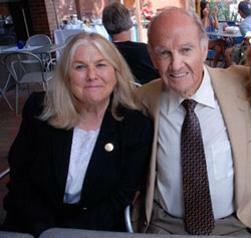 Her friendship with Senator McGovern began several years later and continued until the Senator's death in 2012. When she later visited the McGovern political library at Dakota Wesleyan University, Mitchell,South Dakota in 2013, she was thrilled to find that the poster she had framed and sent to him back in 1982 (two years before she ever personally met him and two years before she chaired his 1984 New Hampshire primary presidential "comeback" campaign) would be kept safe for all history in the library archives, and to the back of it was taped the letter she had sent along with it back in 1982. After the Senator's death in 2012, the framed poster had been removed from whatever wall on which it had hung. When the library archivist invited Nancy to visit the inner archives, it was almost the first thing Nancy saw as the door opened to a vast room filled with shelves of political memorabilia and documents. There it was, right inside the door, on the floor, leaning against a shelf. 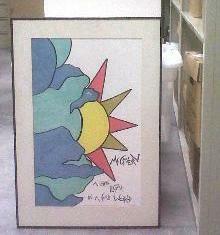 It was a primitive child-like drawing of a colorful sun coming out from behind the clouds and said, "McGovern, A Little Light in a cold world." July 20, 2009 - Nancy and Senator McGovern at lunch following the Portsmouth booksigning. In 1973, after graduating from GWU, Nancy headed to New Hampshire for law school in the very first class of Franklin Pierce Law Center. She returned to D.C. for a law school internship with the U.S. Senate Committee on Banking, Housing and Urban Affairs, chaired by Sen William Proxmire. There she met young Sen. Joseph Biden, the chair of the subcommittee on Consumer Affairs, her assigned internship. Their work focused on banking regulations and consumer credit issues. After graduating from law school in 1976, Nancy passed the Virginia bar (she later passed the NH and Massachusetts bars) and accepted an associate's position with the Washington, D.C. civil rights employment law firm of Robert B. Fitzpatrick, for whom she worked until 1978, when she returned to New Hampshire, where her practice has been located ever since. From 1978-1985 she joined the founder of Franklin Pierce Law Center, Dr. Robert H. Rines in his patent/trademark/copyright litigation/ inventors' entrepreneurial practice and also in support of his scientific and commercial ventures, including the establishment of New Hampshire's first commercial Atlantic salmon fish farm (as well as Dr. Rines' annual sonar searches for the Loch Ness Monster). During most of those same years, during1979-1985, she was a member, then chair, of the New Hampshire Commission for Human Rights, the state's anti-discrimination agency (a volunteer position in New Hampshire, whereby the Commissioners have the power of superior court judges in discrimination cases and can award lost pay, reinstatement, attorney fees and (now) compensatory damages).